The Story So Far: Twelve years after writing probably the most highly regarded New Adventure, Paul Cornell adapts his own novel for television… and surpasses himself. The Book: When Human Nature was published in May 1995, Doctor Who‘s (first) return to television was still a year away, and Big Finish’s audio dramas were several years beyond that; the books were the only ongoing new Who fiction, selling a reported 20,000 copies each. Paul Cornell was the brightest star of this universe, and this was his fourth novel. The then-current series editor, Rebecca Levene, had taken over in 1994 and, after a slow start, was hitting her stride; 1995 would be a remarkable year for the 7th Doctor. Paul Cornell discussing “Doctor Who”‘s book roots in a DVD documentary. The Doctor opens Human Nature in the depths of his angst over his interference with human affairs (and would remain steeped in such angst until he exited the New Adventure line in 1997). Ace, the last link to the Classic Series, had left him for the last time just three books previously (in Kate Orman’s wickedly clever Set Piece). Professor Bernice (Benny) Summerfield, the New Adventures’ first original companion, created by Paul himself for October 1992’s seminal Love and War, was all he had left. The previous book (David A. McIntee’s Sanctuary) was a pure historical, which saw Benny fall in love with French knight Guy deCarnac…who’s left for dead at the end. The following novel (Andy Lane’s Original Sin) would introduce two new companions (not counting Wolsey the cat, who joins the TARDIS in this story). This was, for all we knew at the time, be Benny’s last book as solo companion. Amidst all this context, it cannot be overstated just how eagerly anticipated Human Nature was on the eve of its release. 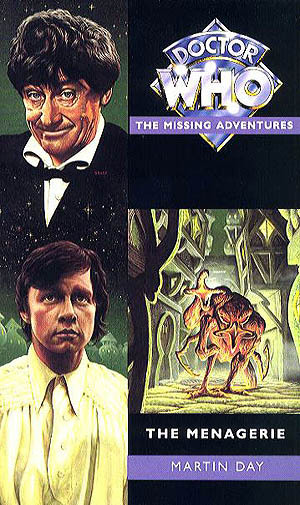 This was the Missing Adventure released at the same time as “Human Nature”. It was … not quite so eagerly anticipated. As with most Paul Cornell novels, Human Nature managed to resonate with fans and stand head and shoulders above the rest of the field. The reviews on rec.arts.drwho were just about unanimous in their praise. Except for… me. It took me three months to even find a copy of the thing (the NAs being notoriously hard to find in the United States at that time), and I didn’t start reading it until my first semester of law school, when I only had time to read the book at the pace of about eight to ten pages per night. My initial reading experience was merely one of frustration, of high expectations that I’d set in my head which no book could possibly meet. The basic plot is about the Doctor seeking to better understand humanity in general, and Benny’s grief specifically), by joining its ranks. He purchases a device which will temporarily render him human; we’re told this through Benny’s eyes, while she’s in a drunken stupor following Guy’s evident death. Next thing we know, the Doctor has become John Smith, a history professor at an English boys’ school in the days before World War I. In this drastically reduced state, Professor Smith is essentially helpless when the alien Aubertides — a family of vicious shape-shifters — invade, in search of Time Lord abilities. The lead Aubertide casts about for intelligence by masquerading as a future Doctor… the 10th Doctor, to be precise. By the time John Smith is able to save the day, much blood has already been spilled. Gallifrey still existed at that point (it wouldn’t be destroyed in the book line for another five years), so a Time Lord (CIA) agent lurks throughout the book, albeit with little plot impact. Aphasia the Aubertide, taken from the e-book of “Human Nature”, hosted by the BBC official website (and now sadly off-line). Illustrated by Daryl Joyce. At the time, I found comfort in deriding Human Nature as a scene-by-scene retelling of Superman II. I said this as if it were a bad thing (though it’s not). My two other fundamental problems with the book in 1995 were: A) I didn’t find John Smith the human compelling enough a character to engage my sympathy, and B) the book’s plot seemed to be contorted in services to Paul’s political views, as opposed to adding an interesting gloss to an independently-compelling story (as had been the case with Paul’s prior Revelation and Love and War) The Doctor’s erstwhile vegetarianism becomes a major plot point, even affecting the way the lead Aubertide shape-shifter is dispatched at the end. The book also perhaps goes overboard with its socialist retelling of World War I, going so far as to include a non-fiction afterword at the end hammering the same point. The character of Shuttleworth, Benny’s landlord in 1914, is a human talking-points memo (and removed for the TV version). 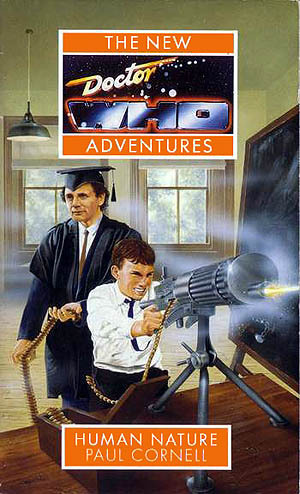 Interestingly, many of the book’s minor characters were named after fans Paul knew, including several rec.arts.drwho posters; this includes Tim, a student at John Smith’s school and one of the main secondary characters, as well as several other minor references (to “Jenny and Jill”, two endlessly-squabbling neighbors, and the use of the phrase “I’m not a happy halibut”). These references would have be undetectable to most of the line’s reported 20,000 readers, but were a big deal on r.a.dw at the end (my name would appear in following year’s Happy Endings). 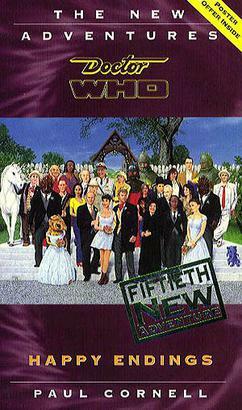 Just about every “Doctor Who” fan who was on the Internet in 1996 could find their name in the pages of this one. Oh, and that Mr. Moffat, in the book? He is … exactly who you think he is. Human Nature (TV): Stripped of the context of the New Adventures, and without Benny, the 7th Doctor, and the Doctor’s unique brand of Marvel Comics’ style hero-angst, Human Nature required quite a bit of scene re-setting in order to fit in as a 10th Doctor/Martha TV episode. Different Doctor (different 10th Doctor, even), different companion, different continuity. All this inures to Human Nature‘s benefit. While the book is rightfully regarded as an all-time great (regardless of all the baggage that I brought to it in September 1995)… the TV story is an even more satisfying beast. Jeremy Baines: Have you enjoyed it, Doctor? Being human? Has it taught you wonderful things? Are you better, richer, wiser? Series Three was in a bit of a rut. The previous three adventures: Daleks in Manhattan, Evolution of the Daleks, and The Lazarus Experiment, were weak when they were broadcast in 2007, and have fared even worse with age. Human Nature, however, literally hits the ground running. In the cold open, the Doctor and Martha are attempting to escape from an unseen alien force. The Doctor hands Martha a fob watch (the first of many times we’ll see that object), begins to speak to her, and then cuts to… long ago, in an English bedroom (the whole business of the transformation, via the “Chameleon arch”, is revealed later in the episode). It’s November 1913, John Smith is “completely human”, and Martha is his housemaid. Where the 7th Doctor got lost in print as the rather inept John Smith, David Tennant has a field day playing the 10th Doctor’s human alter ego, first as a babbling klutz, then as a progressively darker anti-hero. After the cold open, the first half of Part One is fairly leisurely. The biggest driving force is that the school’s matron, Nurse Redfern, has a rather forward crush on John Smith, who responds to one of her advances by falling down the stairs. In the novel, Joan’s romance with Smith was diluted by the book being told through Benny’s eyes. Benny was still grieving from the loss of Guy, and didn’t want the Doctor falling in love; she also dismissed Joan as a “wrinkly racist”. On TV, played by Jessica Hynes, Joan has more weight and depth. There is still racism afoot, as it’s 1913 and Joan is dismissive of Martha’s being “a little familiar” with Smith (“Best remember your position”). But Hynes also plays Joan as a widow who dreads the looming of war, and overcomes her reflexive attitudes toward Martha more meaningfully than in print. Jessica Hynes (Joan) and David Tennant (John Smith) getting acquainted. The Aubertides were replaced for TV by The Family, who descend to 1913 in an invisible spaceship cloaked in a green streak of light. Shapeshifters in print, here the Family murder and possess the bodies of villagers, starting with schoolboy Jeremy Baines, and infiltrate the action from there. After the possession, Baines is played with creepy intensity by Harry Lloyd, a direct descendant of Charles Dickens (himself last seen in The Unquiet Dead). Another Dickens descendant had starred in The Partridge Family; Mr. Lloyd gives Doctor Who the better end of the deal. The other key schoolboy is Tim, here renamed as Tim Latimer, who’s now slightly psychic. Latimer is played with a different type of creepy intensity by Thomas Sangster, i.e. 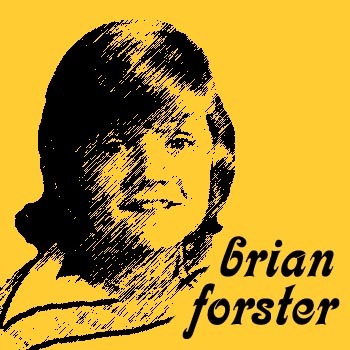 the voice of Ferb from Phineas & Ferb (and no relation to the fan named Sangster name-checked in the novel). As Baines is possessed by the Family, Latimer is possessed by the Doctor’s watch, which reaches out to him and imbues him with the Doctor’s memories. Baines, sensing the Time Lord within Latimer, summons an army of scarecrows, who abduct other humans to house the rest of his family (including Lucy, a little girl with a red balloon, taking the role of Aphasia from the novel). “Doctor Who”‘s Dickens’ descendant is better than “The Partridge Family”‘s Dickens descendant. While John Smith takes quite some time to join the plot, he does find some heroism within himself — using a cricket ball to set up a Rube Goldberg-like chain of events that prevent a baby in a pram from being crushed by a falling piano: not the last time that Tennant’s Doctor will pay homage to Tennant’s future father-in-law Peter Davison, i.e. the cricket-loving 5th Doctor. But Martha (like Benny in the book) is opposed to the Doctor’s falling in love, because she’s already spent most of Series Three in an unrequited crush on the Doctor. “He had to go and fall in love with a human And it wasn’t me,” she moans. The Family of Blood: In the cliffhanger resolution, Latimer briefly opens the pocket watch. This distracts the Family enough for Martha to grab the gun and keep them at enough of a standoff for Joan to evacuate the dance hall. Joan does this, because Smith is hesitant and impotent in the face of the crisis. Tim Latimer: I’ve seen him. He’s like fire and ice and rage. He’s like the night and the storm and the heart of the sun. He’s ancient and forever. He burns at the center of time and he can see the turn of the Universe. Martha Jones: You’re rubbish as a human! But The Family regroups sufficiently to lay siege the school; Smith, to Martha’s disgust, assembles the schoolboys to arms, while the Family stands outside and calls for Smith to be brought forth (this roughly coincides with the book’s plot, minus a nasty subplot in which Tim is murdered by his classmates but survives via inherited Time Lord powers). The Headmaster tries to reason with the Family; Baines deflects him with hints of the coming carnage of World War I, but the Headmaster is a Boer war veteran and still revels in the glory of serving King and Country. Baines lets him live, but Lucy, the little girl with red balloon, ends up killing him about 15 minutes later, after he’s mistaken her for an innocent child. We’ll blast them into dust! Then fuse the dust into glass! Then shatter them all over again! That’s nine out of ten Kindas, for those of you keeping score at home. 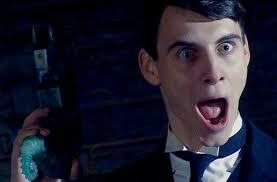 Harry Lloyd (Baines) losing his gift for subtlety, mistaking this for an episode of “The Partridge Family”. Then the time comes for John Smith to shed his human persona and become the Doctor again, in order to save the day. Smith is reluctant and teary; Tennant delivers every possible permutation of protestation that a writer could devise, except for “I don’t want to go.” He also pre-quotes several future Steven Moffat-isms: “Isn’t he a good man?” and “I’m just a story.” Tennant makes John Smith’s plight affecting… to an extent. Just at the moment that I tired of his endless wibbling, Smith and Joan share a flash-forward (via the watch), imagining their getting married and having telegenic children; Smith lives to die old age, satisfied the all the children are safe. And that sound was fandom from 7 1/2 years ago getting punched right in the feels. 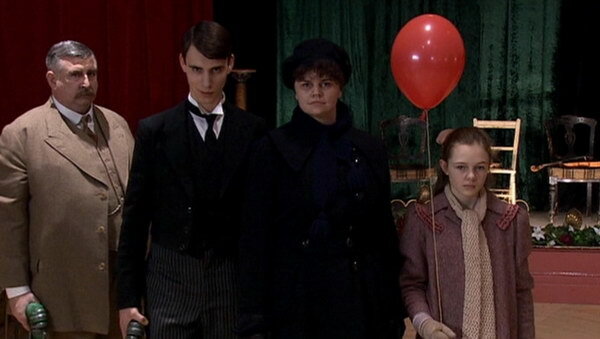 After all the divergences from the novel, with missing or altered characters, the ending of The Family of Blood is still remarkably similar to Kal-El’s gambit at the end of Superman II, with the Doctor impersonating John Smith and tricking the bad guys into grabbing the now-empty pocket watch. But the 10th Doctor visits a much more horrific set of fates upon the surviving Family members than did the 7th in the book — a series of living deaths: “We wanted to live forever, so the Doctor made sure that we did,” narrates Baines from his eternal prison. This contrasts with the Baines-equivalent Aubertide in the novel, who’s turned into … dinner. The 10th Doctor slowly walks away from another vanquished adversary. 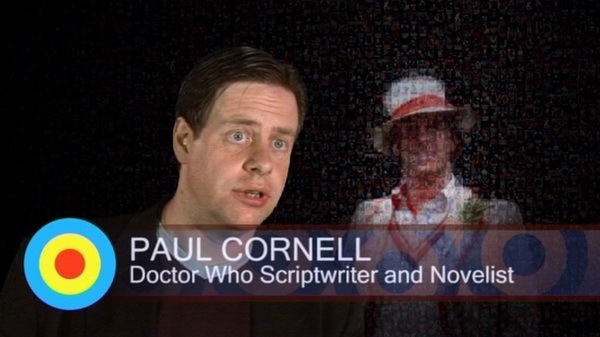 Most of Paul Cornell’s novels contained a lengthy series of decompressive epilogues and post-scripts (on rec.arts.drwho, this was dubbed “Paul Cornell Syndrome”). The script for The Family of Blood is no different, with a lengthy scene in which the Doctor comes back to invite Joan to be his companion, and she refuses; she is then left behind, weeping, with his Journal of Impossible Things. That flips around the ending of the novel, in which it’s suggested the Doctor cries over the loss of Joan even after he’s stopped being John Smith (with Wolsey observing the Doctor, and with the grammatically ambiguous statement: “The cat could see the man was weeping. But there was no-one he could tell”). 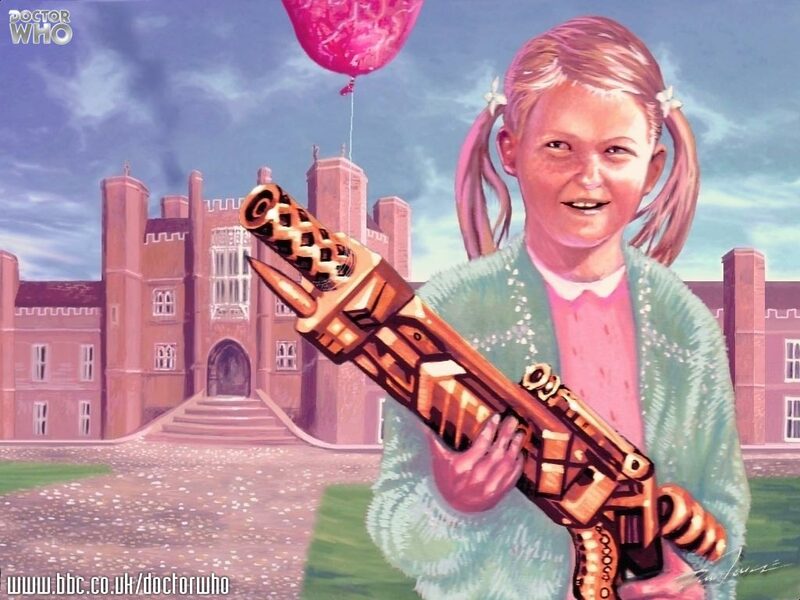 Looking Back: Human Nature/The Family of Blood began an incredibly strong run of stories that would continue with Steven Moffat’s Blink, and then end with Russell T. Davies’ season-ending trilogy, culminating in the Series Three finale, The Last of the Time Lords. Lots of images and ideas from this Paul Cornell two-parter were revisited during the rest of the season, with the pocket watch and the perception filter both being key tools in the Doctor’s eventual fight against the Master. Martha would resolve her unrequited crush on the Doctor first by spending a year walking the Earth spreading his message of hope and resistance, and then by walking away from the TARDIS at the end of the season. 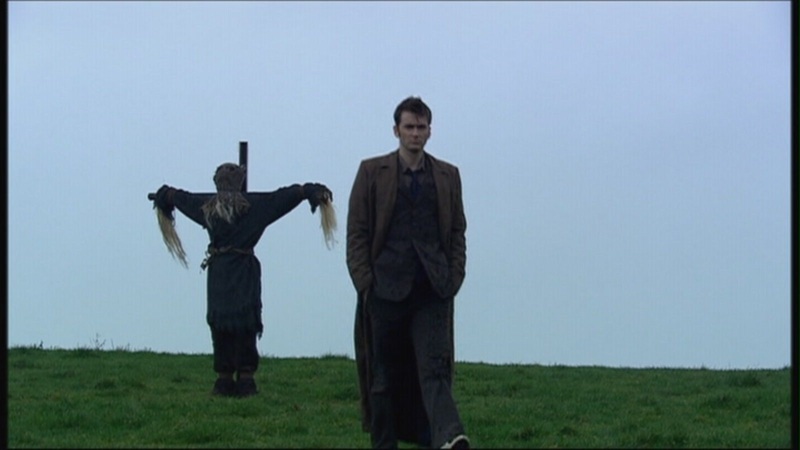 The Doctor’s grim lonely-god revenge on the Family of Blood would be echoed again (and again) against other adversaries over the rest of the 10th Doctor’s tenure. Joan’s descendant, Verity (also played by Jessica Hynes) would return in Tennant’s final story, bringing some closure to Joan’s journey even after she’d spurned the Doctor at the end of Family of Blood. In retrospect, there’s also a lot of material here that features heavily in the present Steven Moffat era [as of November 2014]: there’s the Doctor being called an “idiot” (another quote from Kinda), and there’s Lucy’s fate of being trapped in a mirror — every mirror — to be seen out of the corner of everybody’s eye. I’m not as familiar with every second of the New Series as I am with the old. There’s a good chunk of New Series stories that I still have seen only one time each, from New Earth right up through Death in Heaven. I let seven and a half years go by in between viewings of Human Nature/The Family of Blood, and many of the story’s twists and turns were completely unfamiliar to me. I’d re-read the book several times after 1995, still never quite loving it, and even on TV, the 10th Doctor falls within the lower half of my personal favorite-Doctors ranking. And, in the year that it took me to start and finish this post, I’d lost a lot of the story’s details yet again. So this is not one of my enduring all-time favorites. But it’s still an extraordinarily well-made bit of television. This entry was posted in 10th Doctor, 7th Doctor and tagged 10th Doctor, 7th Doctor, Benny Summerfield, Charles Palmer, David Tennant, Doctor Who, Freema Agyeman, Martha Jones, New Adventures, Novelizations, Paul Cornell, Rebecca Levene, Russell T. Davies. Bookmark the permalink. Took a while to love this book too and it’s been so long since I read it, I hadn’t made the connection between the book and the family of the 10th doctor. I Just had a nagging deja vu that i put down to the fact that trapping Lucy in the mirror brought me face to face with Sapphire and Steel and the horrific idea of evil being trapped in photographs. I’ve never read the novel, but reading this reminded me how long it’s been since I last watched this story. The tenth Doctor is not one of my favorites and I was not a huge fan of him seeming to constantly fall in love, so I tend not to watch his episodes as much (well, except for the occasional rewatch of my personal favorites, like “Midnight” and “Blink”). I remember liking this story, however, even though I didn’t remember all of the specifics. Now I might just have to watch it again soon.